Like I said in my last post the Ravellenics are now over. I finished my Shalom Cardigan with one day to spare...but I still had 34 Hexipuffs to make. I kind of left these to the last minute because I knew they were fast. But they bore me soooo much to do more than a couple in a day. I had declared 50 Hexipuffs and actually made 51 somehow. 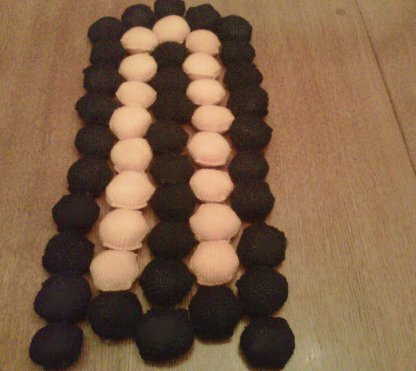 I already have 52 or so puffs in the yellow so I wanted to make all 50 in black to even it out. But then I ran out of black yarn and had no time to go out and get more (especially at 3 in the morning when this happened) but still had plenty of the yellow (Why do I even have this yellow?!) I also ran out of stuffing. I knew this was going to happen and I just let it happen because I was delusional in thinking I'd be able to make another 20 puffs when I clearly only had enough for 10 at the most. So a My Little Pony plush was sacrificed. I'm so sorry, Rainbow Dash. I promise I will stuff you and sew you back up and love you forever. I also at one point managed to switch needle sizes so there are two very tiiiiiny black puffs in there. So I finished those at about 1 p.m. I had 6 hours to make something else! 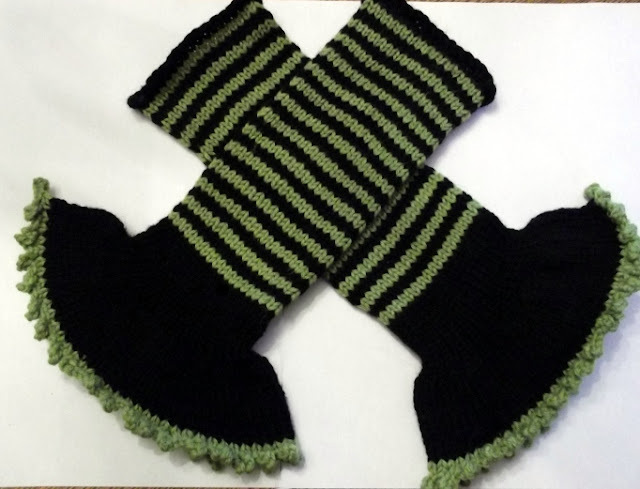 So I knit these up really quick. I had this yarn in my stash for a while and I wanted some sparkly mitts. Finished them just before 6. I had also planned to do some dyeing (at least three hanks) but then didn't have the proper supplies and of course leaving it to the last minute (because "yarn practically dyes itself") meant that of course I didn't have time to run out and get what I needed. I then noticed the next day that I had exactly what I needed all along. Oh well. The Ravellenics are over. I managed to complete 8 items and was awarded with 18 medals! I was originally going to make a Simply Pi Shawl as one of my bigger projects and cast on for that last Friday. I got about 100 rows in before I decided I would never wear it and dropped it. But now I needed another big project! So I spent a day looking for something that was doable in less than a week and still let me finish 34 hexipuffs. I decided to go with the Shalom Cardigan. I had wanted to make it for a long time and figured this was the push to do it. It's designed to be made in bulky weight and doesn't have sleeves. 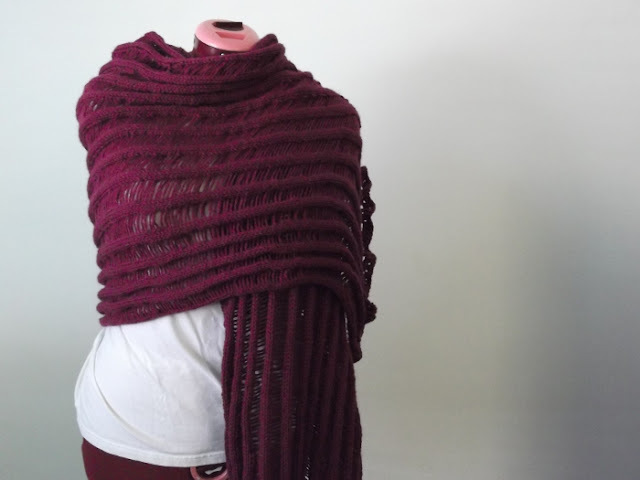 I'm not a fan of making sweaters out of bulky yarn because I'm already bulky enough as it is and don't need any extra. My exception for this is coats/jackets because pretty much any coat I wear will add bulk. So I read some project pages on Ravelry on switching from bulky to worsted and then also increasing it significantly because the pattern is written for a small/medium and I'm more of a 1X/2X (48" bust) but then I got kind of bored and itching to cast on. I just added 12 extra stitches and went with it. After casting on 79 stitches I worked the pattern as written except when I got to the twisted rib section I switched colours to this lonely skein of red I had. 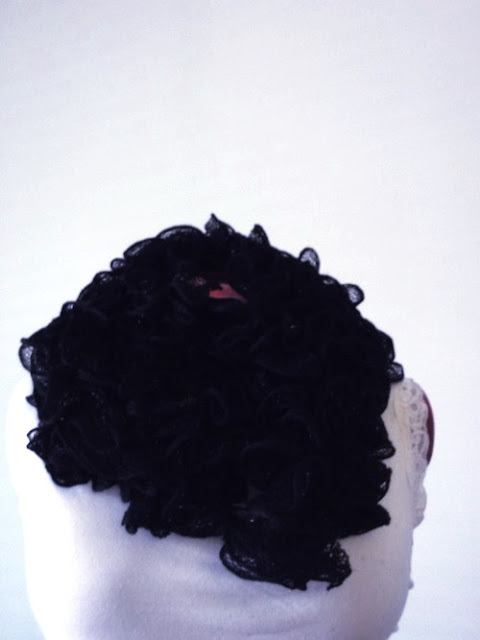 When I got to the garter ridges/increase row I switched back to black. And repeated. I then tried separated the sleeves from the body and tried it on. It fit. But it was just...not right. 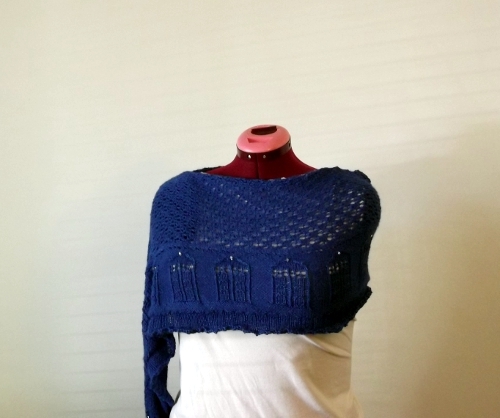 I didn't like the way it cut me up so I decided to add two extra repeats to make the yoke go down to right before my underbust which is what is shown in the original. Those two extra repeats (including increasing in the same manner) added quite a lot of extra stitches and a lot of extra time. Once again after the fifth repeat I separated and tried it on. It fit and it looked right and it didn't cut me up weirdly and I was satisfied. I cast on 32 stitches for the underarm and embarked on the long journey of seemingly endless stockinette for the body. I worked 6 plain rows of stockinette directly after the row where I added the underarm stitches. Then i decreased 4 stitches (double decrease) every 4 rows a total of 9 times. I then increased 4 stitches every 4 rows for a total of 6 times. This landed me almost at a perfect length so I then knit 10 rows of garter and bound off. Moving on to the sleeves I picked up 79 stitches between the stitches I put on hold and the underarm stitches (1 stitch for every 2 stitches I cast on) and knit 30 rows of plain stockinette which reached my elbow. Then I decreased (double decrease) 2 stitches every 4 rows 17 times. And then ended with 10 rows of garter. I wasn't really paying too much attention to the decreases and the yarn was black and I was mostly knitting in dimly lit rooms at night so when i finally looked at it when it was done I was not satisfied with the decreases. If I were to do this again I would have SSK'd and K2TOG'd for a more seamless finish. I originally chose the double decrease because where I was decreasing matched up with the side seams perfectly and I felt it may have been more fluid to have the same decrease throughout. I would definitely change the side decreases as well. This is surprisingly my first sweater of the year and I finished it just in time for some sudden cool weather. Still a bit warm to wear right now though but I have the perfect outfit to wear it with once it cools down more. Or if I'm wearing a coat, a combination of both. I replaced the bobbles with beads because it makes it look like the TARDIS light is on which I like. I don't really know about the colour. I'm not a big fan of blue on me but that may be because i just don't wear a lot of blue. 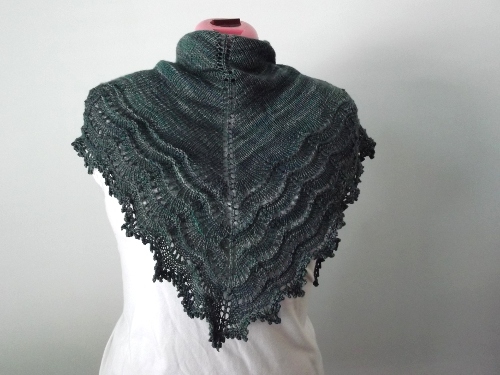 I worked on the lace section for a couple of days and enlarged it to 15 centre repeats instead of the 3 called for because I have large shoulders and I want to wear this in a specific way. I probably could have done closer to 25 repeats and been a little happier with it. But we'll see how it looks when it's blocked. 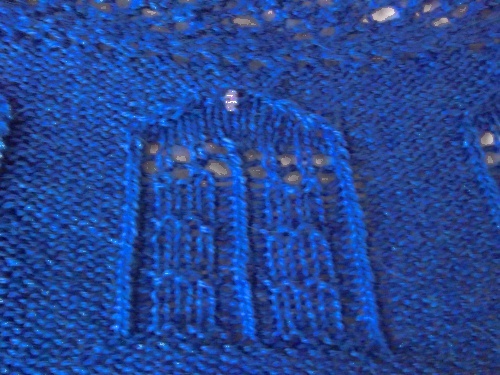 Yesterday I picked up the stitches (433) for the TARDIS section. I picked them up several times. I picked up on the wrong end (the straight edge) twice. Then I picked up every stitch instead of picking up the stitches evenly but I had the right edge that time. Finally I picked up the stitches evenly (4 for every 5 stitches) and started on the chart. If I were to make this again (or had the guts to frog back) I would probably have a little more clearance between the picked up edge and the beginning of the TARDIS. Maybe another 5 rows or so. I also added a bead instead of bobbles to represent the TARDIS light. I thought I had these really great foil beads but it turns out they were gold and not silver so I had to improvise. I had plans to bead the bind off too but I don't think I'll have enough beads for that and I don't want to hunt down more of the same type. I'm hoping to get at least the chart done tonight so all that's left is the ribbing. After typing all day for work and making a scarf and finishing my Yggdrasil my wrists were pretty much on fire. Normally that means stopping. I just switched crafts. 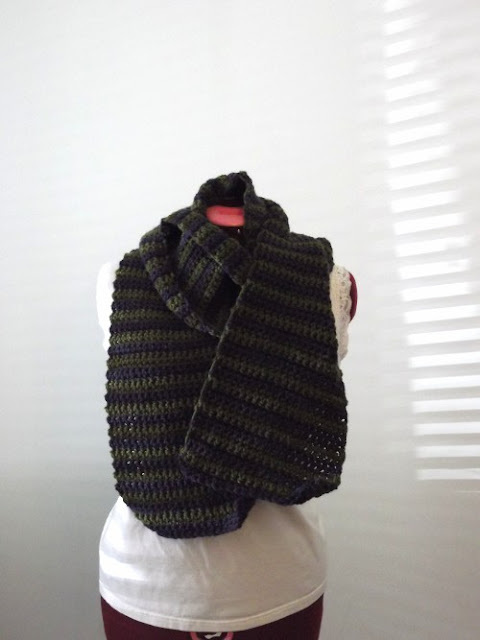 Just a super simple scarf. Chain 21 stitches, single crochet in each stitch for two rows in each colour, go until it's long enough, fasten off. Nice. Simple. Mindless. I originally started with a 6mm hook but it was curling up a lot and didn't seem to flow nicely so I went up to a 10mm. I originally started this blanket as a gift for a friend. 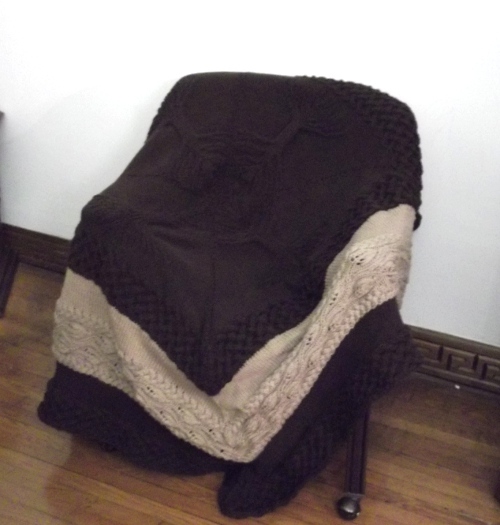 Things sort of fell off course and eventually the blanket sat in a basket for months. Then I started it up again and felt that in just a few short days I would be done! Yeah. Right. I ran out of yarn. I had bought the store out of the yarn when I went. I bought extra thinking "Just in case!" But it wasn't just running out of yarn. No. It was running out of yarn with just a few repeats left. So I think "Fine. No big deal. I'll just buy more" I go to several stores and can't find it. Suspicious. Then I check online. I went from working on it for a few days in March and April of last year to not at all until August. I then picked it up again for a few days in January and finally on February 2nd of 2012 I run out of yarn. 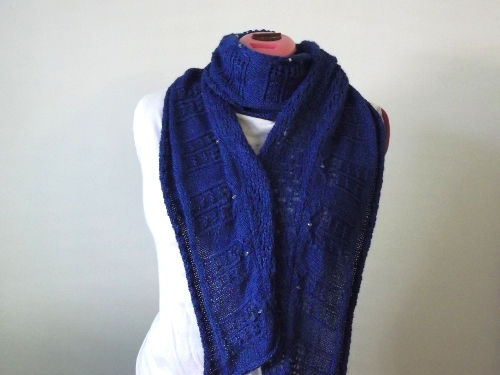 Once I saw that the yarn was discontinued I hopped on Ravelry in hopes that someone had a bit for sale. People did but they never got back to me. I looked once in a while for months and nothing. Finally last week I found some and it arrived on Friday morning just in time for the Ravellenics! DetroitKnitter (here's a link to her Etsy shop too) totally saved the day! So after months and months of waiting for yarn to pop up so I could finish it I managed to complete it in two hours. Which makes me both happy and sad because I'm glad it's finally done and I can wrap it and give it to someone who will use it but sad because I cannot believe I only had 6 repeats of the large braid, a corner, and kitchener stitching to do for it to be finished. It doesn't lay flat. I haven't washed or blocked it yet (although I don't know how much help blocking will be) but I'm hoping it'll eventually spread out once it's being used. To be honest, I don't really care too much anymore. I'm just glad it's done. I have to admit that I really enjoyed working on this blanket. The middle tree chart was really s l o w because I wasn't familiar with the chart yet and there's very little repetition to remember. But after that it's kind of a relaxing knit (until you run out of yarn, that is) and it took less than a month (in total number of days) from start to finish (27). Even picking up all those stitches was fine. I actually learned to love picking up stitches because of this blanket! First, a little history. Last year at almost exactly this time (July 30) I went to one of my favourite yarn shops for their annual big sale. Usually when I have disposable income during these sales I go a few times and pick up all sorts of stuff I never would have really bothered with just to try it out. 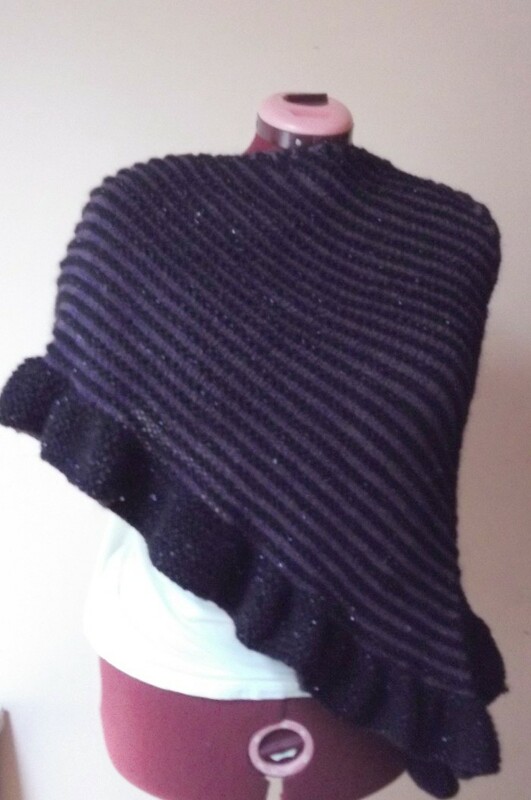 On my last visit of the sale I saw a sample of Frill Seeker knit up into one of those ruffle scarves I had been seeing everywhere. So naturally I picked up a skein. They didn't really have a lot of colours left so I picked up a blue. I'm not too big of a fan of blue but I just wanted to play around with it and see if I liked it. This is an incredibly fast scarf to make. Sort of. The actual knitting is a breeze once you get the hang of it and into the rhythm. The part that I hate is the yarn. It's kind of a net. And it rolls in on itself. And it gets twisted coming off of the skein after a while. 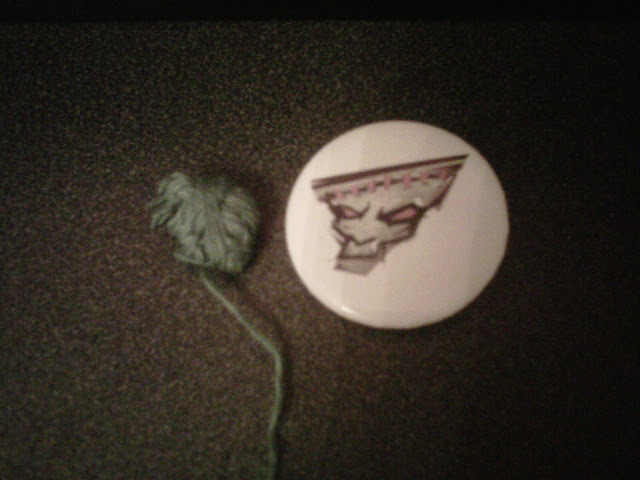 So I spent most of my time pulling it apart and untwisting it as I was knitting. But it's a very quick gift idea and I do plan on making a bunch. I didn't really know what I was doing and you can easily tell if you look at it close enough (fortunately it's very forgiving) One end is significantly tighter and less flouncy than the other. My preferred method of deciding when to make the next stitch is pulling on the yarn with my left hand until it can't really comfortably go any further left (about two inches) and then sticking it on the needle. Very scientific, I know. Most people go with every inch or your thumb length. I decided to start off this Ravellenics with something really quick to kick me into production mode. 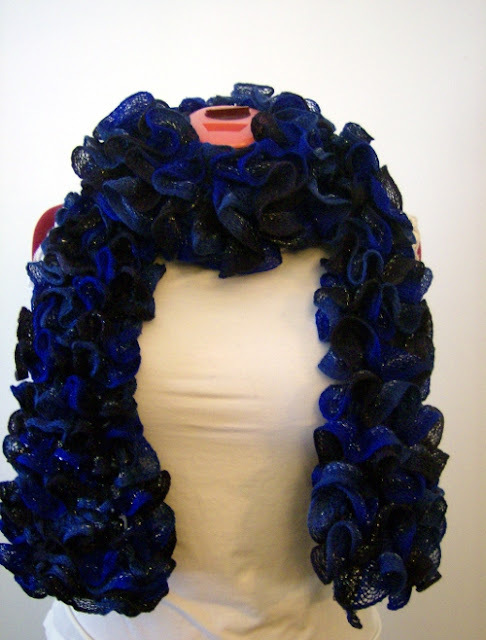 After my mother saw my first ruffle scarf she commented on it A LOT. Which means "Please make me one" So I got the yarn for it for last Christmas and *mumble mumble* didn't quite get around to it. So learning from last year, before I cast on I thought "Hey! 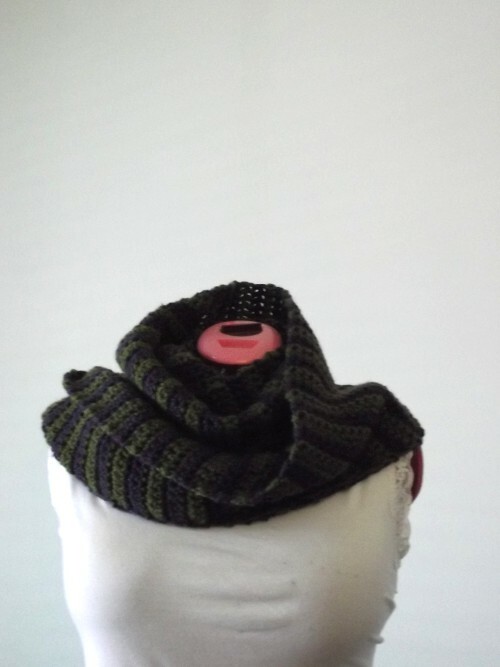 I'm going to pre-stretch out the yarn and then wind it into a bobbin so it'll be easier to knit!" and then I didn't. So I probably spent an hour just fiddling with the yarn. I'd knit a row, untwist, stretch out. 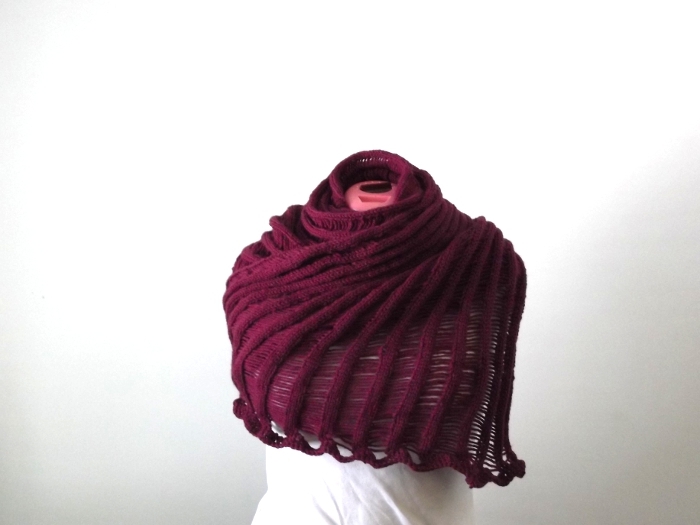 Knit a row, untwist, stretch out. Until finally I could see the end of the yarn. i was getting a little bored frustrated so I ended up making the ruffles a lot looser towards the end. You can't really notice it though. Or at least that's what I tell myself. Also at the veeery beginning of this project I'm happily knitting away (this is before things started getting twisty and frustrating) and then...it stops. The yarn just stops. I cannot stretch it out anymore because for about four yards it's split right down the middle of the netting into two. At this point I had just started so instead of dealing with cutting the yarn and then reattaching it when it went back to normal I just cut my losses and started over. If this had been my first experience with this yarn I probably wouldn't have bothered with a second time. Also fortunately one skein gives more than enough for a scarf so it's not too bad. Just a little annoying. As I'm knitting this I'm reminded of a skirt my niece has. 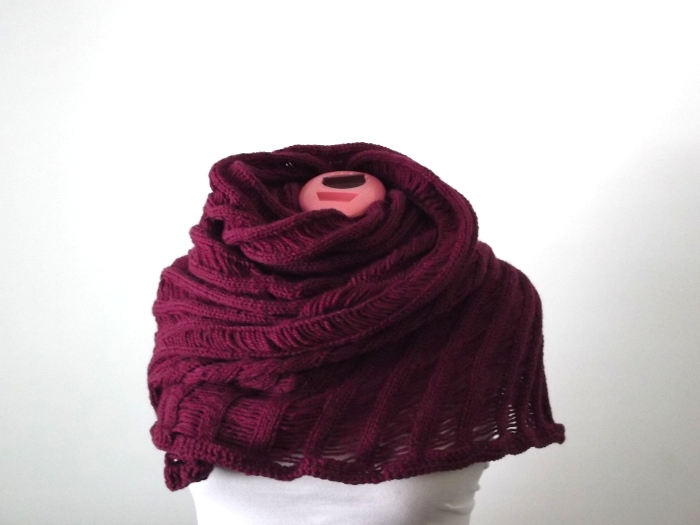 it looks exactly like this scarf except in a skirt...and I really really want it but I don't know if I can knit with this yarn for that long. I also anticipate a size 18/20 skirt would be really heavy in this yarn. Research will be done. So there we have it. My first project in the Games was completed just three hours after the opening ceremonies. Wrapping up FO Parade week is the beginning of a personal challenge. Let me start by saying each year I try to knit/crochet one million stitches. 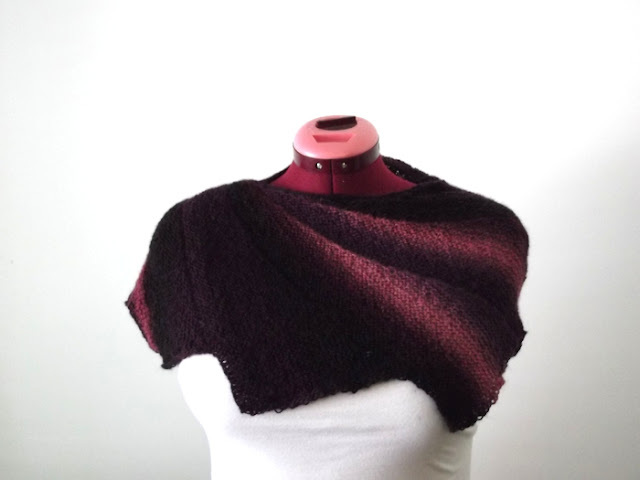 I haven't quite made it yet (and won't this year, for sure) but I also challenge myself to 52 projects a year (different groupings for different types of materials: sewing gets one, knitting/crochet/spinning is lumped together, jewellery/beads another, etc) but this year I thought what about shawls? I love shawls. I love making them, I love wearing them, I love just having them around and stacked up all nice and pretty on my shelves. 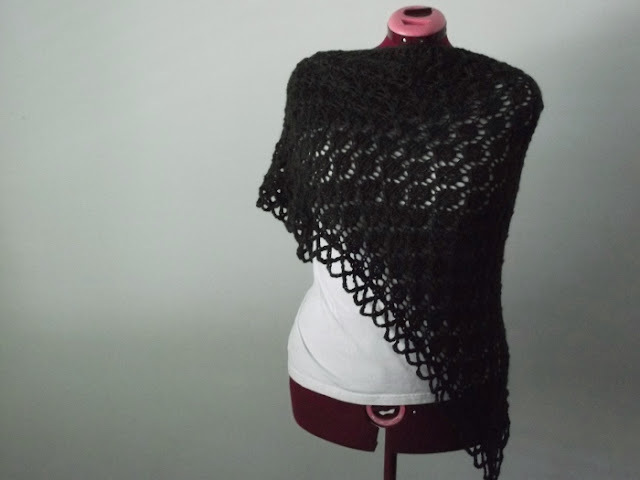 So 52 shawls in 52 weeks starting June 1, 2012. I'm already behind. Here's the catch-up of what I've done so far. I absolutely adore this stitch pattern. They're like tiny leaves to me. But the pattern is a bit too simple and I wasn't all that inspired on the edging. Made with bulky yarn so I did it in one sitting. I've wanted to make this shawl for so long but was scared of starting it because it's in an unfamiliar to me language (Finnish) but I just went for it. And didn't screw it up at all! 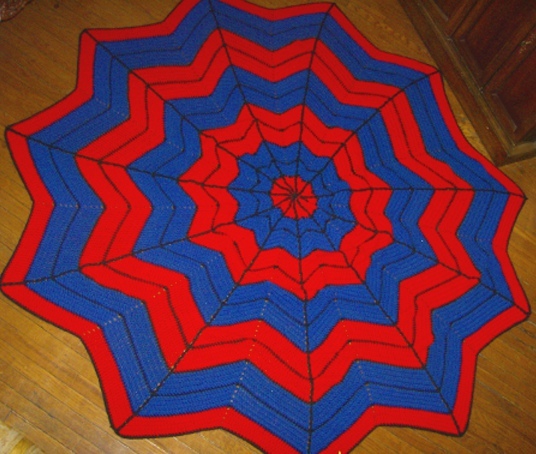 Once I got into the swing of things I barely even needed the pattern. I really love how the knitting turned out. 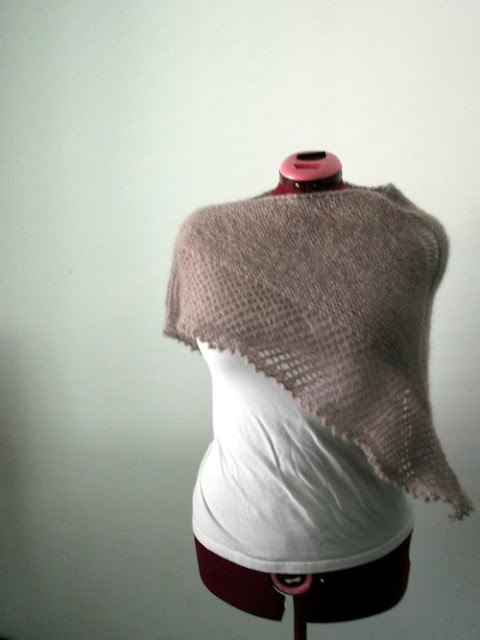 I just wish it were bigger (and this is after a very aggressive blocking session) I may make this again but either go up a needle size or go up a yarn weight + needle size. Love this yarn. Love this pattern. Will definitely be making this again. My plan for the next one is worsted weight with alternating sections of black/green. I didn't actually follow this pattern at all. I left the house with yarn and needles and started it on the subway with just an idea (fortunately the correct one) of what the project looked like. A child sat down next to me and started to pet it as I was working on it and I was like, "Uhhhh...no". He ran off. 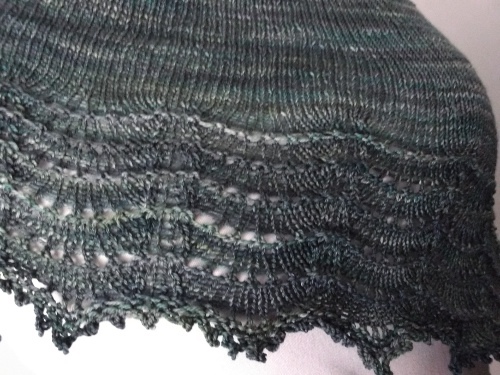 So I just knit a garter stitch shawl until I had just about half of the yarn left. Then I started on the eyelet section. After looking at the pattern I saw that I did the second half of the eyelet differently (I ssk'd) I kept going until I had just enough yarn left for four rows of garter and a picot bind off. I think my eyelet section is longer than the pattern but it's the same basic thing. I know I made a purple Citron when the pattern was first released. Can I find it? No. I never even wore it OR got a photo of it. I have no idea what happened to it but I do know that I finished it. I made this one bigger because I remember that upon finishing the first one I thought "Yeah...this is too big for my football shoulders" So I did seven sections instead of the five called for. I also added two extra rows in the gathered section because I like the wider gather (okay, I screwed up on the second gathered section and accidentally made it too big and then discovered I liked it) this, of course, backfired because I ran out of yarn on the ruffle (only made it to row 6 of 11) and then i also ran out of yarn on the bind off. 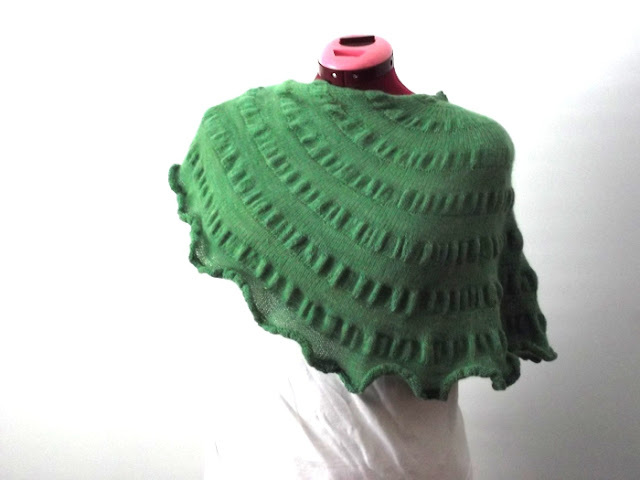 Fortunately I had some more Malabrigo Lace in a green variegated that had the exact green running through it. It's only slightly noticeable. What makes it less noticeable is I like the unblocked ruffley edge more so you really can't even see it at all. Bonus! Just for reference this is the amount of yarn I started the bind off with (button is for scale) of course trying to convince myself "Oh yeah, there's plenty there for an 800+ stitch bind off!" I made it about halfway. You know those days when you really want to knit but don't know what to knit at all? Pair this with an uncontrollable need for a Harry Potter marathon and I ended up with this. 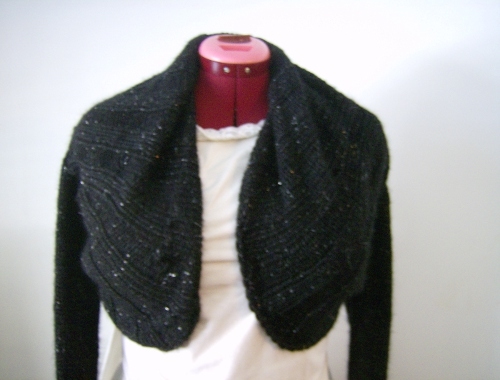 Cast on until it "looks right" and knit stockinette until you run out of movies or you get bored. Actually I stopped because it was getting really long and annoying to hold it out of the way. Then when you get to the end bind off 3 stitches, crochet 6 chains, drop 2 stitches and keep going to the end. I single crocheted a little border along the ends so it didn't curl so much and had a bit more structure to it. 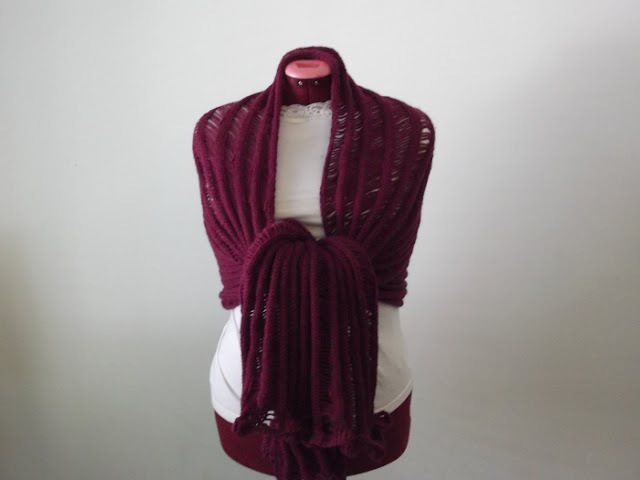 I love long and wide wraps because there's so many possibilities in wearing them. I am the shawl lady. I've put shelving in my closet just for my shawls. 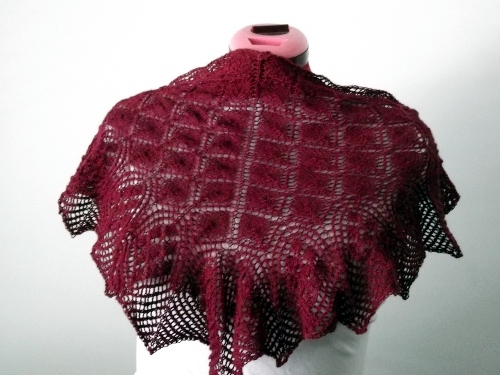 The following few days will be dedicated to the shawl. First I'd just like to say that I whenever I see Schoppel-Wolle Zauberball I get really excited and then say the name horribly wrong in a really weird voice. It's just one of those things that I do that I have absolutely no logical reason for. This was a nice mindless knit that produces a really great result. Unfortunately I wish I had more yarn and had made it bigger as right now it's just a shawlette but I have plans for making another one. I just adore the colours and how they stack up in this pattern. I love glitter. Everywhere I go there is a trail of glitter (which a lot of my friends...and their pets...hate). Last summer I was yarn shopping and came across possibly my new favourite yarn Diamond Luxury Collection Baby Alpaca Glimmer. I cannot begin to explain how much I love it. First, it's baby alpaca which is so very soft and squishy and loveable. And. It's. Sparkly. That's pretty much all you need to get me to spend my yarn budget on your yarn. I loved the idea of this pattern but it just didn't look all that great on me. I put it on from time to time to see if it'll look better but it's going to the frog pond soon, I think. It's super super warm which is nice in the winter so I'm hoping to make something much better with it. So when I fell in love with this yarn for the first time I shared it with my mom. She then, also being a fan of glitter and super softness, fell in love with it as well. There was some hank cuddling that day. She also had what I would describe as a ratty ugly disgusting scarf. It just wasn't right for a knitter/crocheter to be walking around with a scarf like that but i knew she'd never make one for herself. So for Christmas I made her a new scarf. She argues that it shows it off, as nice scarves ought to be. I say, make your own scarf and look at it, I'm cold! My mother also wears these velvet gloves in the winter. Please note that we discovered the alpaca will stick to the gloves which often then gets all over the place when she takes them off...or just when the gloves are in contact with anything (her steering wheel is covered in winter) this seems to be just a velvet issue. I say it's a bit of a extra bonus feature because now your gloves are sparkly too. I love this shawl. 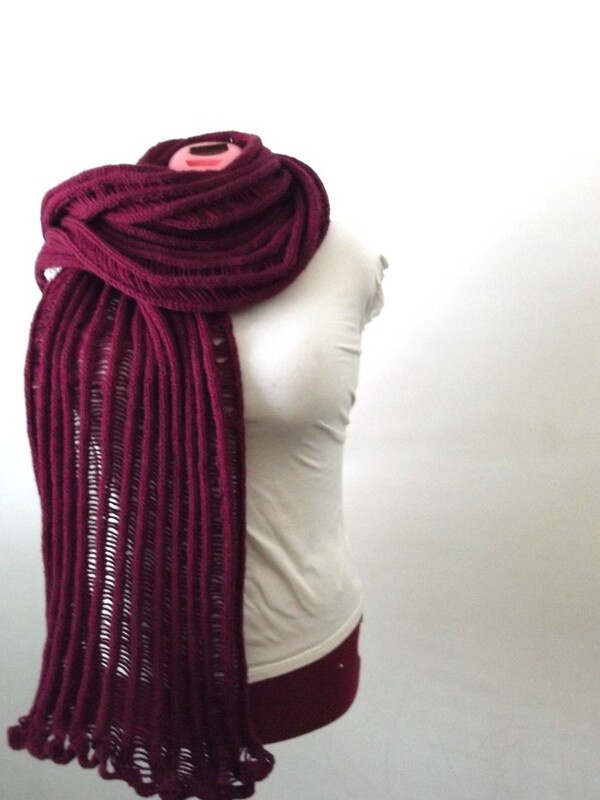 I cannot wait until it gets cold because I am going to wear this so hard. Glitter, stripes, purple/black, AND ruffles?! It doesn't get much better...except for the green/black and the red/black ones I am also planning. 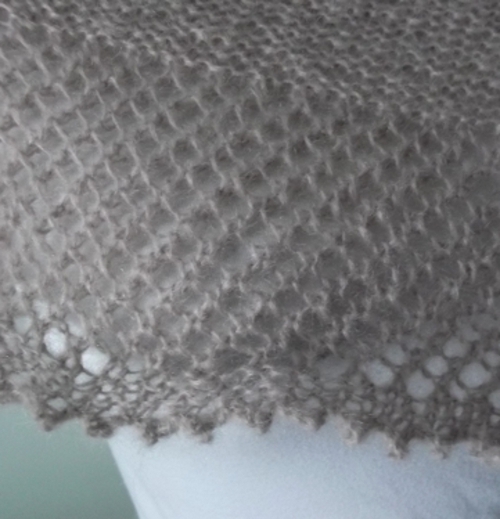 This is one of those patterns where the yarn does all the talking because it's just so simple. It's bulky yarn though so it is very very heavy. 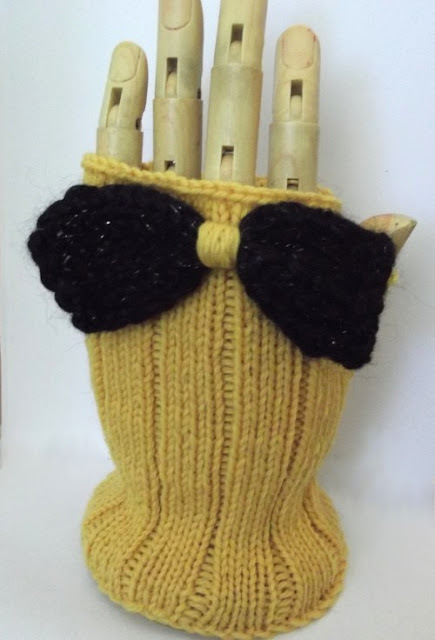 Continuing on with overdue finished object posting week the second parade is dedicated to fingerless mitts. I don't really like yellow and I think the only reason why I had this was because I was intending to make a Flash/Reverse Flash double knit scarf...which I now really really want to make again. Note: Buy more yellow..and probably red too. But I had a bit of an obsession with this Baby Alpaca Glimmer stuff (which will have its own parade shortly) and have a ton of little bits left which were next to this yellow in a bin and i kind of fell in love with the contrast. After being forced to wear giant hair bows my entire childhood (seriously, you could pick me out in a crowd of kids from the hairbow alone) I kind of fell off the bow bandwagon but now all of a sudden they're adorable again. 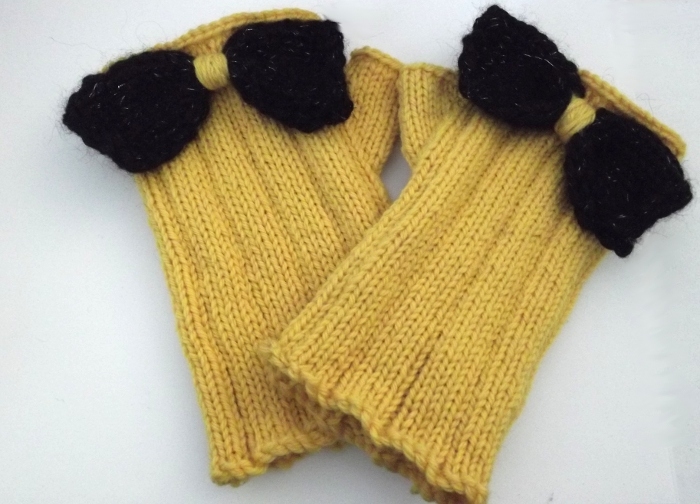 So I must now make a million different pairs of bow mitts. They're simple, cute, fun, and have a little bit of glitter. I love glitter. 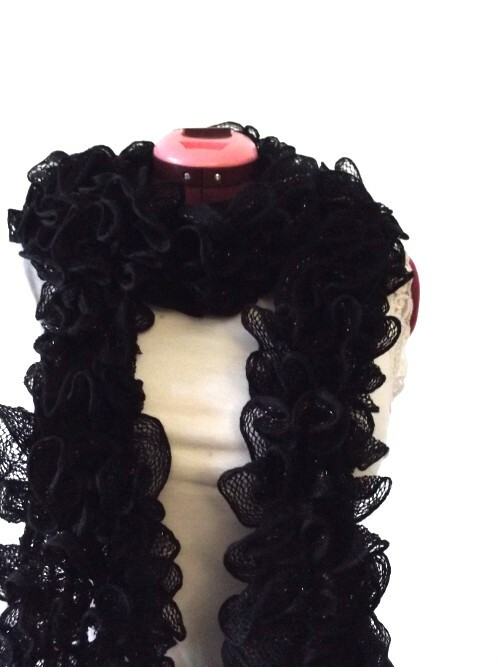 The details on the why are very fuzzy except I like laced up things and I love this ribbon. I love this ribbon so much that I recall buying several (possibly close to a hundred) yards of it many years ago. I love green and black. I love green and black stripes. I love ruffles. I love picot bind offs. 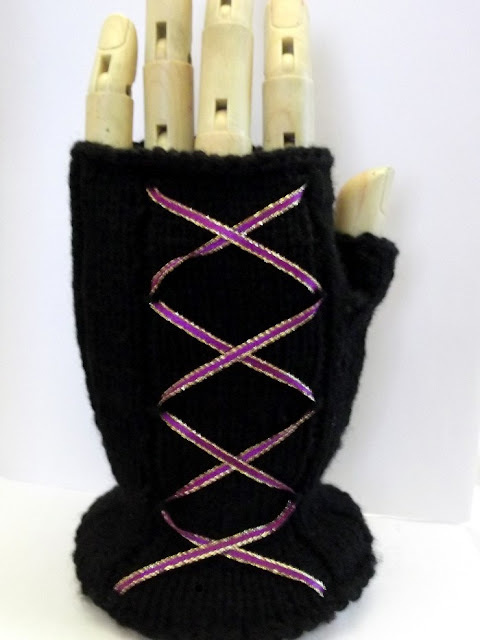 Most people tend to describe my style as "Dark elegance" and these mitts suggest dark elegance to me. Should have done something else for the cast on because they curl quite a bit but it's not too much of a big deal. And normally I hate just plain stockinette on mitts and much prefer ribbed patterns because they're more likely to stay on and look perfect but they fit snugly on me. And have just enough ruffle flare peeking out. It's been way over a year since an update and although I thought I hadn't made anything in that time I actually have. Only have photos of the knitting/crochet end of my creative life so I'll be updating in the way of FO parades. Today is the nerdery one. Projects inspired by my nerdom. 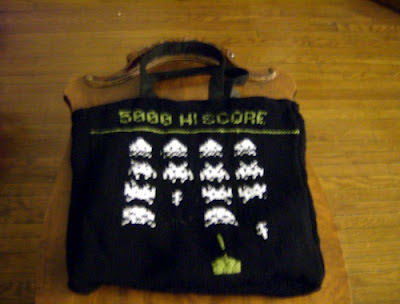 This was my purse for about 10 months. I only took a couple crappy night time photos and now I'm not entirely sure where it is...but it probably looks like it's in bad shape from all the use it got. I lined the inside with just canvas and there's a tiny pocket on the inside. For some reason I had a looser tension for the back (possible accidental needle size upage) but I quickly fixed that issue by folding in the sides a bit and making some seams in the bag. More of a purse than a totebag now. I wanted to make this forever because I'm a huge Space |Invaders fan...and now looking back on it I may make it my dedicated knitting bag because I forgot how much I loved it. Rivalling my love of Space Invaders is Zelda. When I say I love Zelda I mean I LOVE Zelda. I will do a runthrough of Ocarina of Time about once a week. I kind of obsess over the story/history/theories. And by kind of I mean really really obsess. 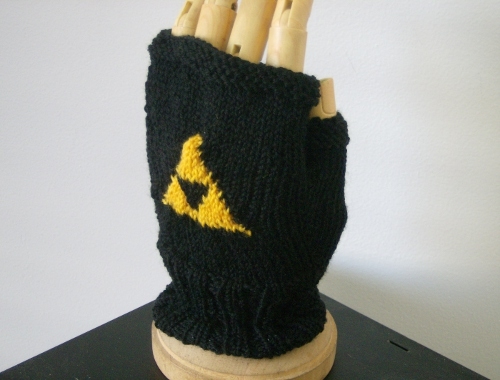 I used slightly thinner yarn than what the pattern called for so the triforce is much smaller so I'm hoping to make another pair soon and also the matching Twilight Princess Scarf. I'm just going to start by saying that I am not the biggest fan of Spider-Man. In fact, I can only read the comic books for a short amount of time because I want to punch him in the face. 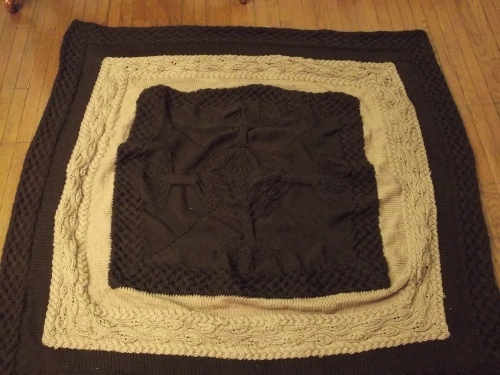 However I love Venom and the original plan for this project was to make one Spidey and one Venom blanket (Which is sitting in a bag waiting on more yarn). Surprisingly this one took a month and the other one...well it'll be over a year before I finish it. Right now this is probably the most used piece I've ever made as it's made it onto my bed as my blanket. It's huuuuge. And I am so glad I made it out of a yarn that can be washed a million times. It only now (after a year of use) is starting to pill a bit but it's easily fixed when washed again. 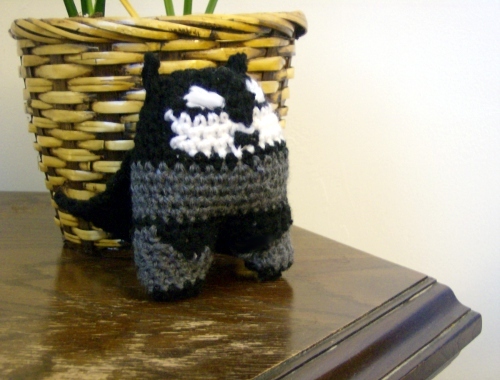 It will of course be tossed into my closet with the other blankets I've made and replaced by the Venom one. I have a lot of blankets in that closet. I adore making blankets but most never even get used once. One day. 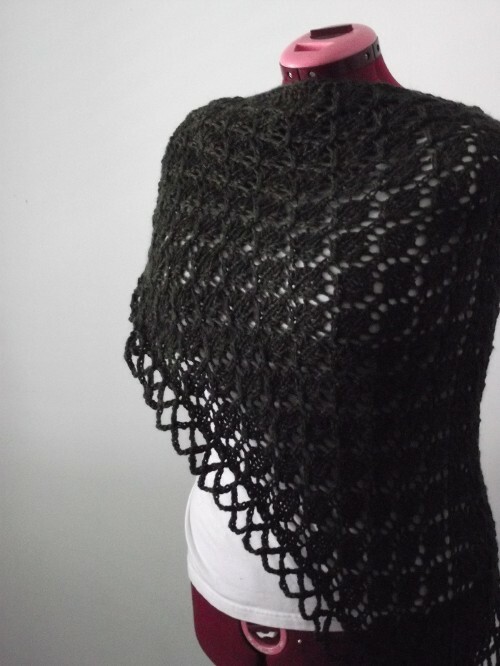 Ravelry Project Page: I AM BATMAN! I love this little guy. He's so chubby and squishy.